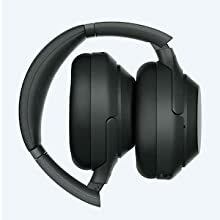 WH-1000XM3 impressed us with its sound quality, comfort, sleek, lightweight design, stellar battery life and rock solid connectivity. See what happens when it’s just you and your music, with noise cancelling that cuts more outside sound than ever before. 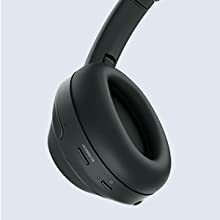 And experience how smart headphones can be with advanced noise-cancelling technology such as Adaptive Sound Control, and the convenience of smart features including Quick Attention, Voice Assistant compatibility and touch control. 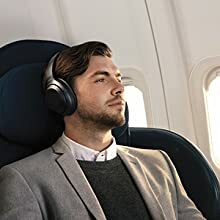 Escape the sounds of the city with industry-leading noise cancellation. 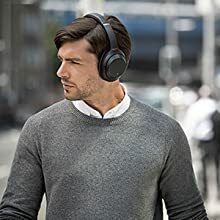 The noise-cancelling technology in the WH-1000XM3 headphones is our most advanced ever with close-fitting ear pads and our HD Noise-Cancelling Processor QN1. 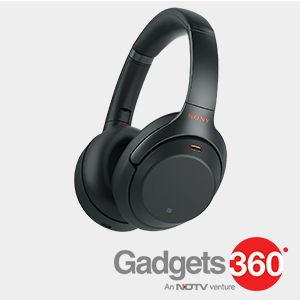 With our new HD Noise-Cancelling Processor QN1, noise-cancelling power is greatly enhanced. 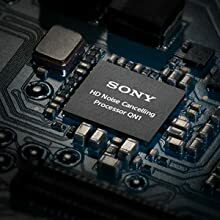 Having a dedicated NC processor also ensures the reproduction of your music is never compromised due to processor performance. 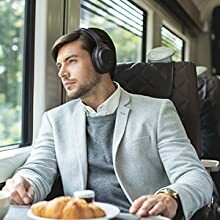 Most noise-cancelling headphones are designed to block out vehicle noise when traveling. 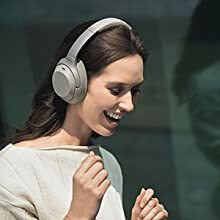 The WH-1000XM3 headphones are no exception, but are also highly effective at blocking out daily noise like voices and the background sounds you might hear walking through a city. Unique Personal Optimizing analyzes the sonic characteristics caused by head size, glasses, and hair, then optimizes sound to you. 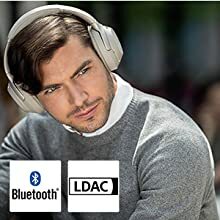 LDAC transmits approximately three times more data (at the maximum transfer rate of 990 kbps) than conventional Bluetooth wireless audio, allowing you to enjoy High-Resolution Audio content in exceptional quality, as close as possible to that of a dedicated wired connection. 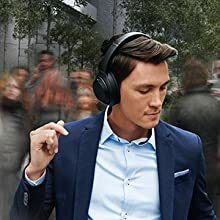 A built-in amplifier integrated in HD Noise-Cancelling Processor QN1 realizes the best-in-class signal-to-noise ratio and low distortion for portable devices and delivers exceptional sound quality. 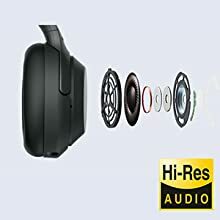 Powerful 1.57″ drivers with Liquid Crystal Polymer (LCP) diaphragms make the headphones perfect for handling heavy beats and can reproduce a full range of frequencies up to 40 kHz..
Be aware of everything around you, from street to office, take trips without interruption and lose yourself in music with no background noise. 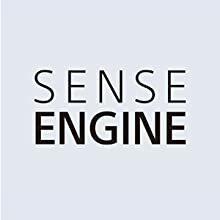 SENSE ENGINE gives you the power to tune in and out of your music at a touch. 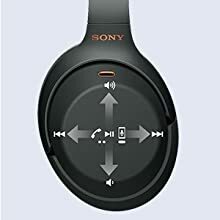 Adaptive Sound Control automatically detects your activity such as travelling, walking and waiting, then adjusts ambient sound settings to you. Super soft, pressure-relieving earpads in foamed urethane evenly distribute pressure and increase ear pad contact for a stable fit. Comfort is further enhanced by a larger and deeper ergonomic ear space structure. And with a lighter weight design, your music is the only thing you’ll notice all day. Ask it questions. Tell it to do things. It’s your own personal assistant, always ready to help. Simply press and hold the noise-cancelling button and ask your phone’s assistant something while pressing. Conversation flows freely with easy, hands-free calling. Leave your phone where it is, just speak with a double tap. Thanks to several microphones, WH-1000XM3 delivers clearer voice quality to the other person on the phone. With up to 30 hours of battery life, you’ll have enough power even for long trips away. 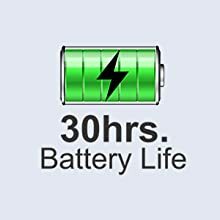 And if you need to charge in a hurry, you can get five hours’ worth of charge after just ten minutes with the optional AC adapter. The ear cups swivel inwards so they pack up neatly in a compact case.